Jakarta can be a challenge for travellers as it is sprawling, dirty and confusing, but it is also interesting: a collision of people and cultures and religions which may be a bit overwhelming but can also be entertaining. The city's attractions, for the most part, are sprawled across varied regions making it difficult to know where to start as a tourist seeking worthwhile things to see and do. A great starting point, particularly if you've just landed in Indonesia, is Indonesia Miniature Park (Taman Mini), which showcases the cultures and some of the treasures of the different islands and regions in the archipelago, giving visitors a good overview of the whole country. Here you can find recreations of famous temples and statues and examples of the architectural styles of different Indonesian cultures. A good way to get a sense of the layout of Jakarta is to pay a visit to the National Monument of Indonesia, the city's landmark obelisk, which you can ascend for impressive views, and which houses a small museum showcasing the fight for Indonesian independence. 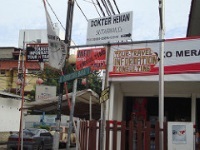 This is also one of Jakarta's main meeting points for locals and is a lovely spot to indulge in some people watching. Those interested in the colonial history of Jakarta should stroll around Old Batavia, the rundown waterfront area surrounding Taman Fatahillah Square, which was once the centre of Dutch rule in Indonesia. Although not well maintained this old district still boasts some 16th-century buildings and other unexpected relics. Other popular attractions in Jakarta include the Istiqlal Mosque, the largest mosque in Indonesia, and the Museum Bank, a beautiful old building that once housed one of Indonesia's first banks and is now an intriguing banking museum. If you are travelling with kids in Jakarta be sure to check out Kidzania theme park which is one of the city's most celebrated fun zones. We are looking for contributors for our Jakarta travel guide. If you are a local, a regular traveller to Jakarta or a travel professional with time to contribute and answer occasional forum questions, please contact us.